Copyright © Cambodia Research Network. The Jarai also reside in Raleigh, Greensboro, and Fayetteville, North Carolina. For more information of the Jarai, visit the Montagnard Dega Association website. 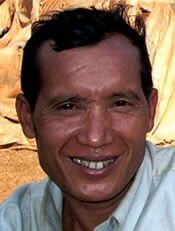 The Jarai (also Gia Rai, or Gia-rai) originate from Vietnam's Central Highlands. Their language is related to the Cham language of central Vietnam and the Malayo-Polynesian languages of Indonesia, Malaysia, Madagascar, Philippines and other Pacific Islands (Hawaii, New Zealand, Easter Island, Samoa, Guam, Fiji, etc.). In Vietnam, they are the largest of the upland people group of the Central Highlands known as Dega or Montagnards. Following the Vietnam War, many Jarai (as well as members of other Montagnard groups) who had been allied with the United States were resettled with their families in the United States, particularly in the state of North Carolina. Along with the Jarai people, the Bahnar, Koho, Bunong, and Rhade people, all Vietnamese Central Highlands people groups, reside in North Carolina. The Montagnard population in the North Carolina of the various people groups is about 10,000. Most live in Raleigh, Greensboro, and Charlotte. Greensboro and the surrounding area, located between the Raleigh and Charlotte, is a natural meeting place with the largest concentration of families and individuals. To learn more about the various Montagnard people groups in North Carolina, go to the Montagnard Dega Association website. 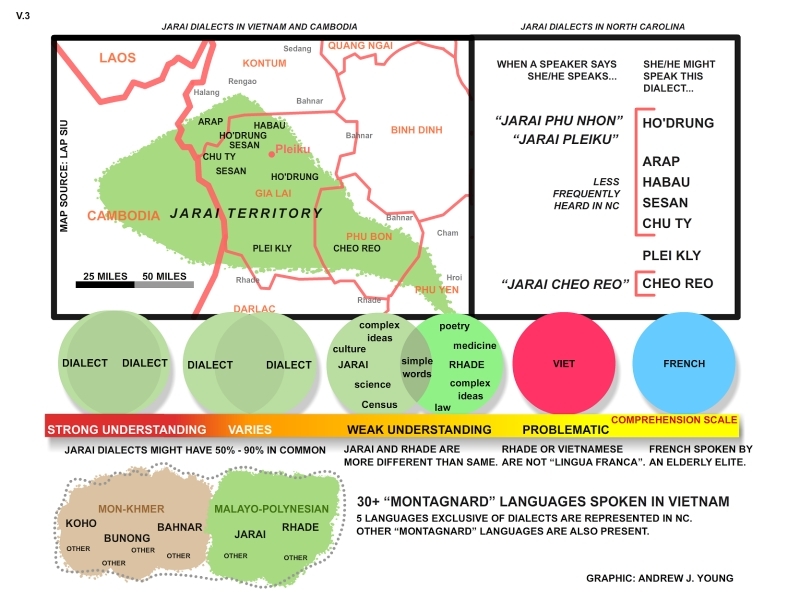 The following chart illustrates the Jarai language in comparison to the various Montagnard language groups in North Carolina. That the Jarai evangelicals will take the Gospel message to other Vietnamese Central Highland peoples and beyond. That Jarai evangelicals will grow in their Christian faith, avoiding the seductive nature of living a mere secular way of life in the United States. That Jarai evangelicals will take the message of hope back to their homeland in Vietnam.